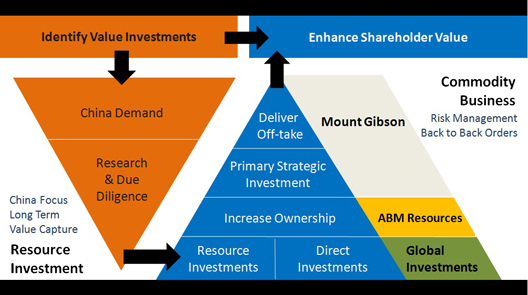 APAC’s investment approach is simple. For the benefit of our shareholders, we are committed to managing risks and opportunities. We invest in what we understand and where our expertise lies – natural resources. Our aim is to capture the value curve of mining companies from exploration to production stage. As long term value investors, we adopt the fundamental and research-driven investment approach to minimise risks. We look at the demand coming from China’s urbanisation and the supply in the market. We diversify our portfolio and commodity range by investing in emerging resource companies globally with minor stakes with a view to grow to Primary Strategic Investments with significantly increased stakes. Investment – On a macro level, we look at the demand and supply from China’s market. Once a commodity has been established, we search and select target investee companies and evaluate their management expertise, ore grade, mine location, cost profile and other factors to decide whether to act further. As value-oriented investors, our investment strategy is long term so heavily focused on fundamentals. Combining research and due diligence, our investment portfolio comprises a spread of minor positions with the potential to become Primary Strategic Investments that will gradually enter production. This will in time provide us with new sources of off-takes which will be delivered to China through our Commodity Business. Commodity Business – We are risk-averse. We aim to schedule all shipments back-to-back with no inventory. Combined with the market intelligence and proprietary research of our investment team, we have a powerful platform to grow and diversify our Commodity Business.